JOHANNES VERMEER: trust an independent-minded Dutchman. For centuries European painters reserved the use of ultramarine – the rare and precious blue obtained from lapis lazuli – for the Christ Child and the Virgin Mary. Vermeer uses it all over his canvases (see pics below). Vermeer uses his ultramarine to paint Dutchwomen. They are neither saints nor sinners; they are women. And they are beautiful to behold. They are 17th century Dutchwomen, accomplished, whether pouring milk from a jug (The Milkmaid at the Rijksmuseum) or here in Vermeer and Music: The Art of Love and Leisure standing or sitting at the keyboard instruments of the day – virginals or clavichords – playing guitars, lutes or citterns, having music lessons, or playing a leading role in supplying the music for tavern celebrations, parties or musical gatherings around the songbooks of the day. You'll find the colour in skirts and dresses; chair covers, curtains and draperies and used to tone down flesh tints (look at the neck of The Guitar Player). Vermeer mixes it with red lake to make purple (the carpet over the table in the foreground in The Music Lesson), with green earth to make an even more vivid blue (the draped cloth to the right of the figure in The Guitar Player). He applies it in flecks in the under painting and scattered throughout his compositions as a kind of leitmotif colour to harmonize the whole. And look at their faces (strangely difficult in an age where the face of woman is used in so many commercial contexts). 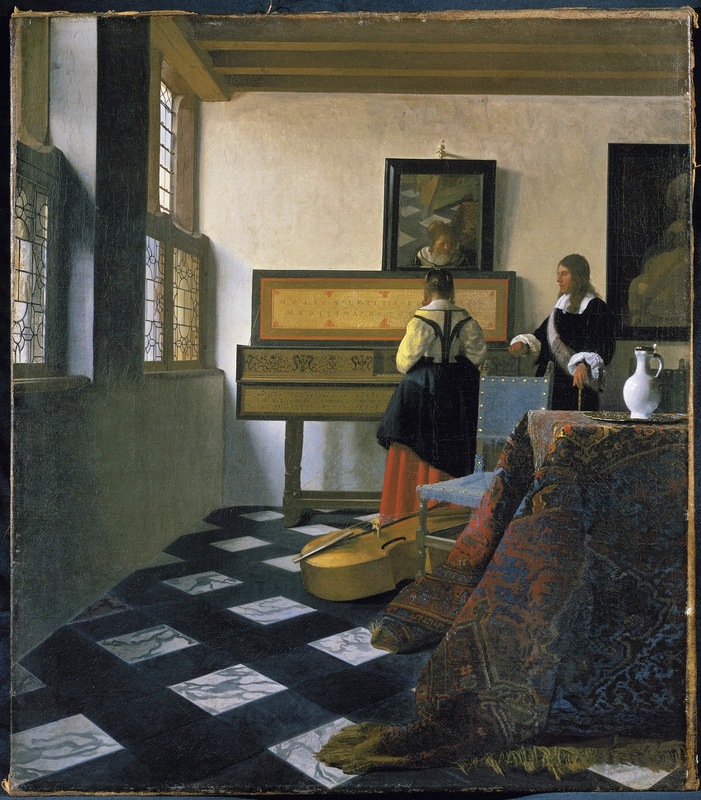 Vermeer is selling only music. It's almost as if the painter is pointing out that music, in and of itself, perfects and makes harmonious everything it touches. In The Music Lesson, he even manages to tilt the mirror above the instrument slightly so that we see the the face of the player, a soft smile on her face as she manages some difficult passage perhaps . Vermeer, consummate artist that he was, was also a genius of geometry and perspective. According to Betsy Wieseman, Curator of Dutch and Flemish Paintings, whose show this is, he deliberately allowed space in his paintings for the sound of the music to emerge and permeate the senses of the viewer. 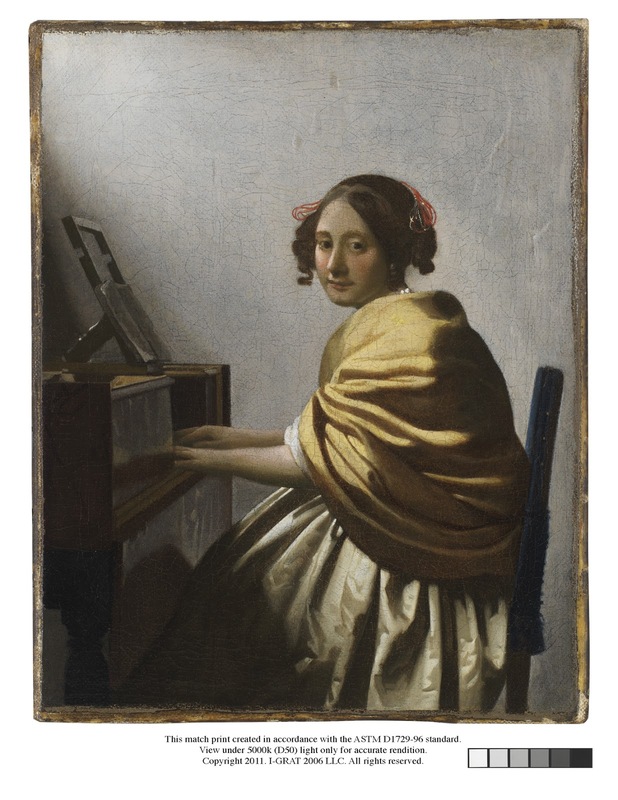 Her book, Vermeer and Music, is available from the gallery shop. As a special treat, on Thursdays, Fridays and Saturdays, the rooms will resound to music of the period played by the Academy of Ancient Music and a whole host of lunchtime and evening events. Times of music performances: Thursday: 11 am, 12 pm, 1 pm, 3 pm, 4 pm, 5 pm; Friday: 3 pm, 4 pm, 5 pm, 6 pm, 7 pm, 8 pm; Saturday: 11 am, 12 pm, 1 pm, 3 pm, 4 pm, 5 pm. I am indebted to the Scientific Department's David Peggie and Helen Howard for the results of the technical examination of four late paintings by Vermeer on display in the exhibition. Part II follows when I've had a chance to attend the exhibition when the musicians are present.